Yes! I Want To Stop Holding Back! You’ve come so far… all those spiritual retreats, trainings and certifications. All the online courses. Business coaching. You know what you’re doing. You’re amazing at what you do. But you’re just as amazing (even more than you can imagine) at something much bigger that you’re keeping a lid on. You know what I’m talking about… the spiritual magic you carry that you don’t tell people about. You’re afraid you’ll blow people away, scare the crap out of them (and you) or they just won’t believe you. Coaches have told you not to talk about the “how” of what you do, when really it’s the experience people have with you that they will remember the most. You’ve been silenced and you’re silencing yourself when it comes to your spirit and essence being expressed fully in your business. And you know what? You’re not alone. I’ve been there and I discover new level of it as I and my business grow. Good news is, I know how to un-silence myself and bring the power of my spirit and voice out. That’s what I want to share with you. The fear of being persecuted or even executed for coming out with your gifts and giving them and yourself a powerful voice… it’s time to shift that fear. Holding back has been slowly eroding your confidence and killing your spiritual legacy, when that legacy is why you’re here. What if you had your own personal training ground to help you feel safe and confident bringing out your deeper hidden magic and your authentic voice? You know those thousands of dollars you’ve spent on trainings and coaching? This is the missing piece that will make it really tick. Not only will your business grow, but YOU will start to feel and feed your own fire in ways you haven’t even imagined (that’s the really fun part!). You can begin to bring your magic and medicine out NOW safely, without letting fear stop you. I can’t wait to share with you how. These sessions are short, sweet and interactive. The medicine songs will ground you and instantly connect you with Spirit. Most of all, if you implement all of the practices, you will begin to see your spiritual development and your business evolve each other. 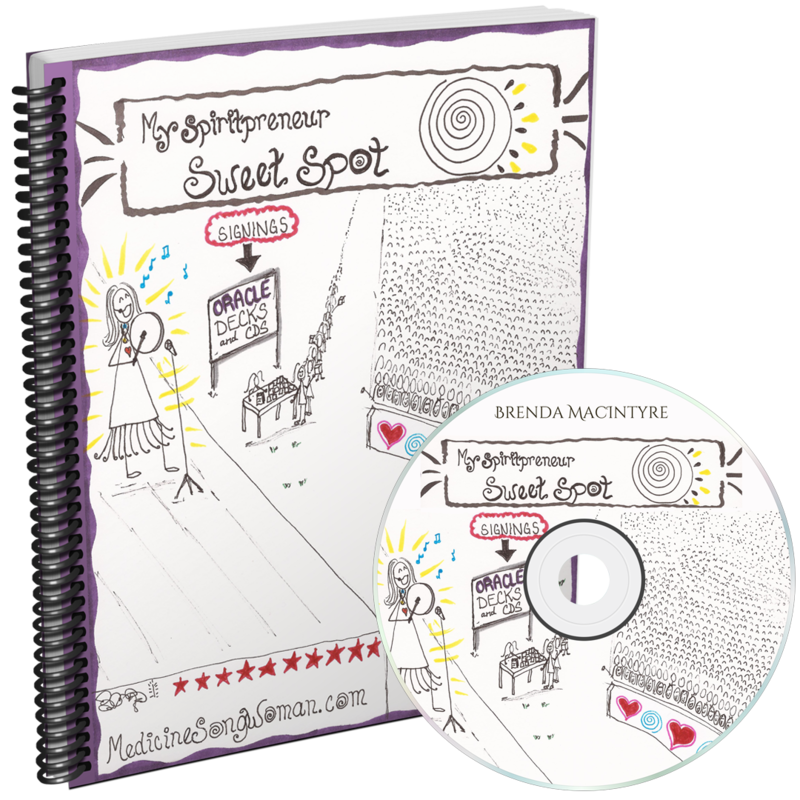 That’s the Spiritpreneur Sweet Spot I’m talking about. This kit normally sells for $197, but the way I see it, the more spiritual entrepreneurs who know about this, the happier I will be, because most of us are half asleep in our business without knowing it. It’s time to change that.